There was once a show called Name That Tune, where contestants would compete to name a song in the fewest amount of notes. There weren’t too many rounds won by hearing a single note. 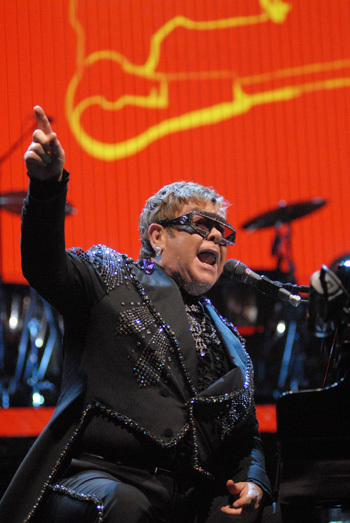 For the fans gathered inside Tulsa’s BOK Center Saturday night for Elton John’s “Farewell Yellow Brick Road Tour,” they accomplished the feat. When John sat down in front of his piano after taking the stage, he played the opening note of “Bennie and the Jets,” which was instantly recognized by the crowd. What followed was a nearly three-hour trip of some of his biggest hits, with some lesser-known songs sprinkled in for good measure. He also spoke of Tulsa’s own Leon Russell, telling the audience that he wanted to let them know how much Russell meant to him, even referring to him as his idol. 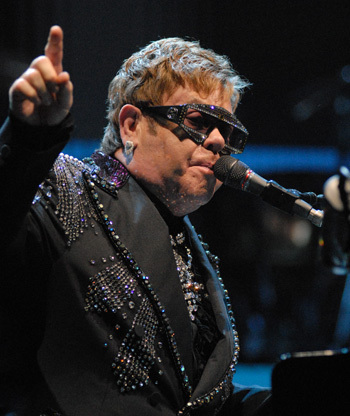 A massive video screen set up behind the stage was an effective complement to many of Sir Elton’s songs, including “Rocket Man,” which featured a spaceship flying through space and “Candle In The Wind,” where a montage of a Marilyn Monroe played for the song’s duration. Although the evening was virtually a performance of many of his greatest hits, John still managed to share some deeply personal life experiences. He said that in 1990 he had hit “the bottom of the ladder” and eventually had an epiphany, finally uttering three words: “I need help.” After admitting to himself that he needed help, he became clean and sober and “I got my life back in balance.” He also said, “I believe in the power of compassion and love,” and created the Elton John AIDS Foundation, in part to get rid of the stigma attached to this disease. To date, the foundation has raised $400 million and reached 100 million people. Throughout the evening, John gave the members of his backing band, especially longtime drummer Nigel Olsson and guitarist and musical director Davey Johnstone. At one point, Johnstone was playing a bright yellow guitar with “Goodbye” printed on the front. Another of the British rocker’s biggest hits was “I’m Still Standing.” If Saturday night’s show was any indication, that statement is true. This entry was posted in Out & About on February 11, 2019 by admin.